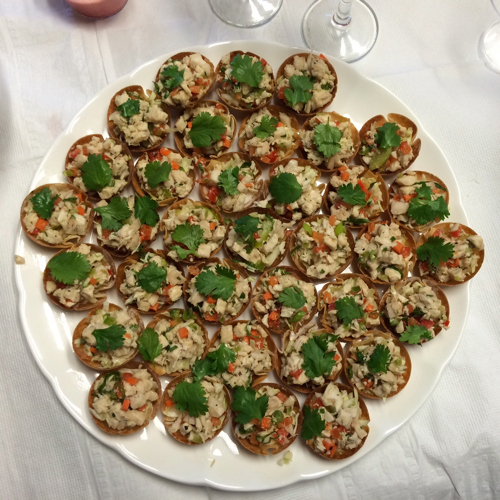 This chicken salad appetizer came about because I needed to a filling appetizer for an event. It needed to be something easy and be made ahead of time. This appetizer is perfect for that. The wonton cups can be made a few days in advance. The chicken salad can be made one or two days in advance. To make this dish completely gluten free, serve on cucumber slices or in lettuce cups. 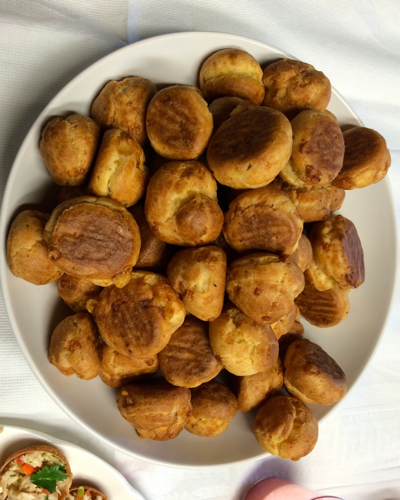 If you make this dish, I promise you guests will be craving more! A brunoise cut measures 1/8x1/8x1/8 of an inch. It is a cube that is smaller than a small dice. For this recipe is it necessary to cut this small in order to fit in the wonton cups. If you are serving this dish another way fell free to cut everything bigger. To make wonton cups, cut 1 1/2" circles with cookie cutter. Spray a mini muffin tin with nonstick spray. Place circles in cups. Cook at 350 for 8-10 minutes or until golden brown. To make chicken salad, combine first 8 ingredients together. Set aside for dressing. Combine remaining ingredients except cabbage. Add enough dressing to chicken salad to taste. Combine cabbage lightly with enough dressing to coat. To assemble, place enough cabbage to coat the bottom of the wonton cup. Add about 1 teaspoon chicken salad on top. Garnish with sliced scallions or cilantro leaf. 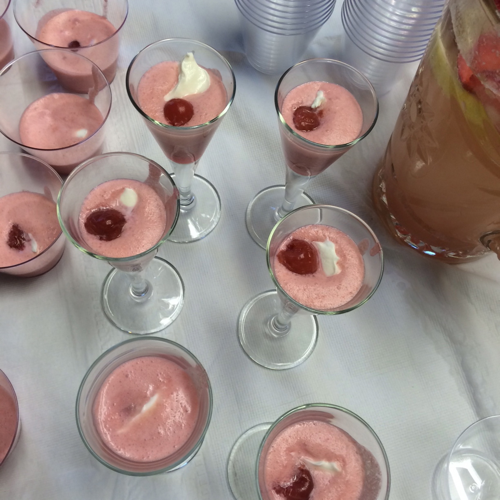 Enjoy at your next holiday party. Alternatively bake wonton chips for dipping into salad or serve as a sandwich. Cheesecake is a classic dessert. This version uses a unique citrus fruit called a Meyer lemons. It's a combination of lemon and Mandarin orange. It gives the lemon a sweet flavor. It can be used to replace lemons in any recipe. Frankly, I love Meyer lemons. I use them frequently at home. They can be used is sauces, desserts, salads, pies, chutneys and the list goes on. Of course if you cannot find them at your local grocery store, substitute lemons. Preheat oven to 350. To make crust combine gingersnap crumbs and melted butter. Line a half sheet pan with parchment paper. Press gingersnap crumbs in an even layer on sheet pan. Bake in oven 8-10 minutes or until golden brown. Let cool. 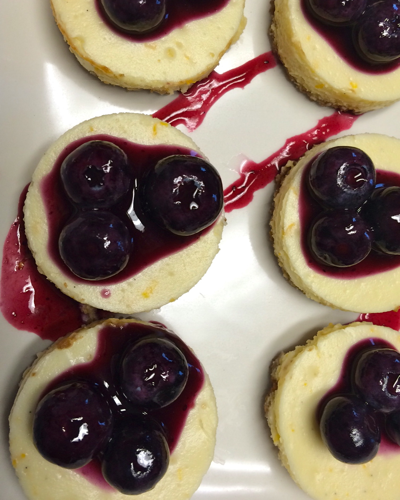 While crust is cooling, make cheesecake filling. Place cream cheese and sugar in the bowl of the mixer. On low speed mix until combined. Scrape the sides of the bowl occasionally until throughly combined. Once combined, add remaining ingredients until completely mixed. Spread mixture evenly over crust. Bake at 350 for 40-50 minutes or until set in the middle. To make the sauce, combine 1 pint blueberries with water, sugar and ginger in small sauce pot. Cook over medium heat until blueberries burst. Place in a container and let sit overnight with ginger. The next day, remove ginger and add lemon juice and vanilla. Puree blueberry mixture until smooth. Place back over low heat. Meanwhile combine cornstarch and second measure of water. Stir into blueberry sauce and heat until thickened. Mixture will boil. Remove from heat. Add remaining blueberries to sauce. 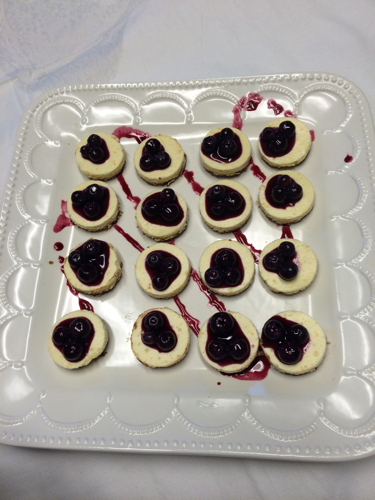 Serve on top of cheesecake. Nothing is better than a warm bowl of soup on a freezing cold day. Right now we are experiencing very frigid weather with temperatures of 7 degrees or below. A soup like this would be perfect serve with this weather because it will warm you and your household. This butternut squash soup is full of flavor and looks beautiful as well. 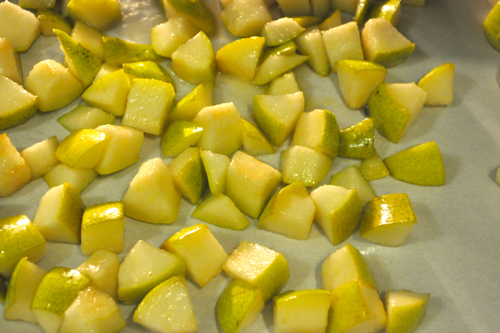 It has settle complexities of flavor with the curry, sweet pears and delicate squash. If you didn't like butternut squash soup before you will now. It is sure to change your mind. As a added bonus this recipe is perfect for entertaining because it can be made a day ahead and then reheated and garnished when served. It is sure to impress your guests. 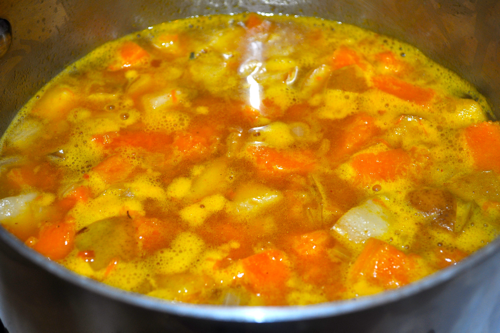 To make this recipe vegan, omit the cream and use vegetable broth. 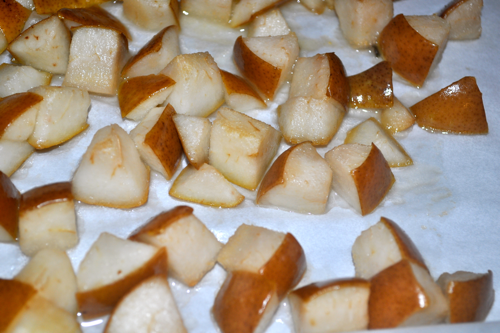 To roast pears, toss with 2 teaspoons lemon juice and 2 teaspoons evoo. Roast at 400F for 15 minutes. To make soup, heat stock pan over medium heat. 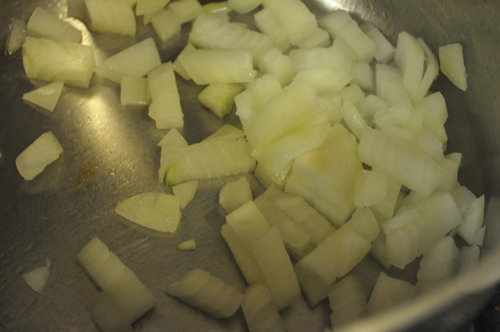 Saute onions in olive oil until tender and translucent. 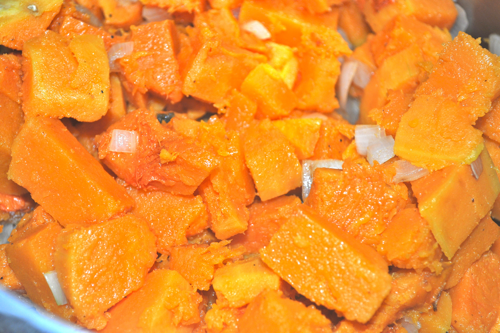 Add squash and 4 pears. Saute for a couple minutes more. Add broth, curry powder, and ceyenne. Bring to a simmer. Simmer 15 minutes. Add cream, salt and pepper to taste. Garnish with reserved pears and pepitas. 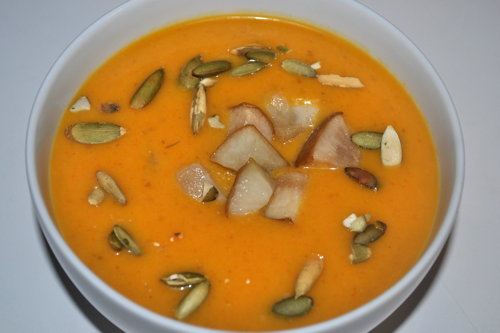 An amazing butternut squash soup!